From left: Student intern Sophie Osorio and Anna Nachamie with the winning poster at the EPA meeting. Anna Nachamie, operations administrator for the CPO, is the first author. Co-authors are Sophie Osorio, an intern with the CPO; research aide Jesse Gruber; Richard Evans, senior vice president and chief experience officer at NewYork-Presbyterian; and Dr. Neel Mehta, assistant professor and medical director of the Division of Pain Management at Weill Cornell Medicine. 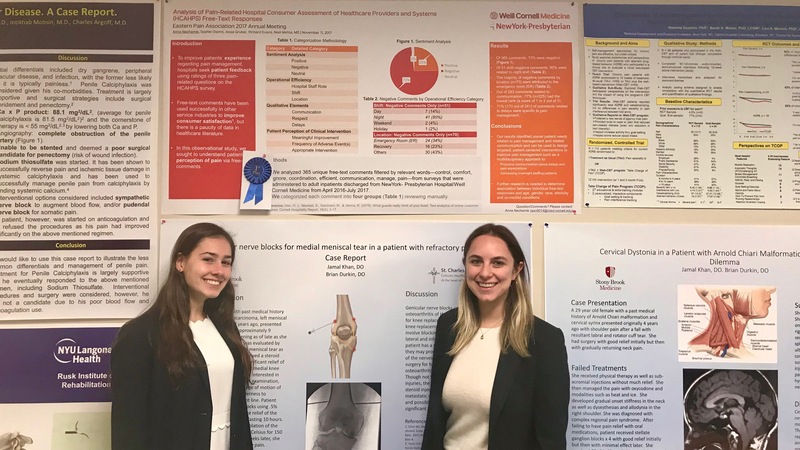 Osorio, who is currently a high school senior, developed her own categorization methodology to analyze more than 300 pain-related free-text comments from surveys administered to adult patients discharged from NewYork-Presbyterian Hospital/Weill Cornell Medical Center from April 2016 to July 2017. She was able to take ownership of the project and turn qualitative comments from the patients into a quantitative tool which could be used to improve healthcare practices. The study is part of an on-going initiative to improve the overall patient experience regarding pain management. “Our research was a first pass at analyzing these comments in a structured way. We hope to move on to understand demographic and clinical variables that may impact certain responses,” said Nachamie. Free-text comments have been used successfully in other service industries to improve consumer satisfaction, but there is a paucity of data in healthcare literature. Formed in 1964, EPA is the oldest Pain Association on the East Coast, pre-dating The International Association of the Study of Pain (IASP) of which it is now a chapter. Dr. Mehta sits on the Executive Board.